To all the regular blog readers out there, are you tired of reading about resolutions yet? Me too! Obviously it creates timely content, but they seem to fall into two categories. a) Wildly ambitious and therefore unlikely to stick (lose 20 lbs! Why not start with 2 lbs a week?) b) Deeply thoughtful and slightly new-agey because resolution type a. never works. (P.S I loved Erin’s post on this same issue here.) I’m all for hitting the reset button in the new year, and on Pinterest over the weekend I came across the above quote. I think it’s a great bullet point list for evaluating and setting some small attainable goals across the board. 1. Fairly obvious, but this one is your job. Hopefully you are doing something you enjoy. If not, don’t quit your job, but make yourself visible. Brush up your LinkedIn profile, spend some time reconnecting with your network, and keep your eyes open to new opportunities. 2. Doesn’t this sound more fun than “lose 20 lbs”? An incredibly odd thing about me is that I actually enjoy gyms. Some days I’m not in the mood, but there is something about the sweat dripping, rosey cheeked camaraderie (and cute workout clothes) that I actually enjoy. Plus, if I’m not working out at least 4 days a week I am total you know what to live with. Running is my hobby of choice, but I’m mixing in more weight routines and intervals to avoid plateauing. 3. This is the one we all tend to neglect. 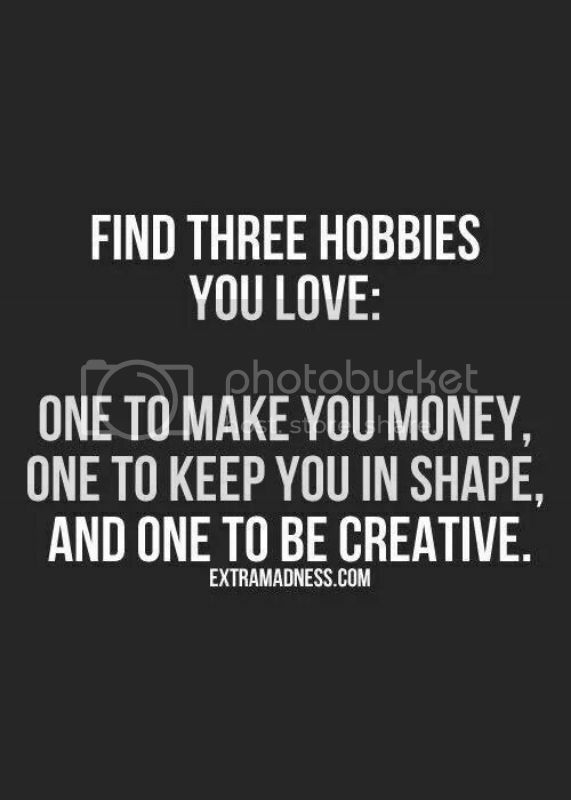 What’s the thing you enjoy doing even if you don’t have to? Or something you used to like that you let totally drop off the radar? I have a couple, but one that always comes to mind is writing. In all of my jobs writing has been a major part of the position, and because of that I would let hobby writing fall off the map. This year I plan to write 300 – 500 words a day just because. They may show up on here, but they may not. In either case it keeps the creative juices flowing, my skills sharp, and I like it. What do you think about this method of goal setting? This entry was posted in Life etc and tagged Goal Setting, New Year Resolutions, Rule of 3. Bookmark the permalink. I really like this post! Especially the part about doing something that you like, but has fallen off radar. I use to like to sew things just for fun and somewhere that has gotten lost. Either too little space or can’t find my sewing machine. So children beware of what might be coming your way!